Wow, the Kids Clothes Week Challenge was really fun, but I guess I stopped around day 6. Never got around to that last pair of madras plaid shorts, but I'll get to them eventually. I have been working on some teacher appreciation gifts I wanted to have ready for this week. Hopefully I'll have pictures tomorrow. After all that garment sewing, I have been dreaming of making a few quilts. So why not make three at once? First up is my Patchwork Prism Quilt. I initially decided to make this out of my Anna Maria voile that I've been saving for a special quilt. 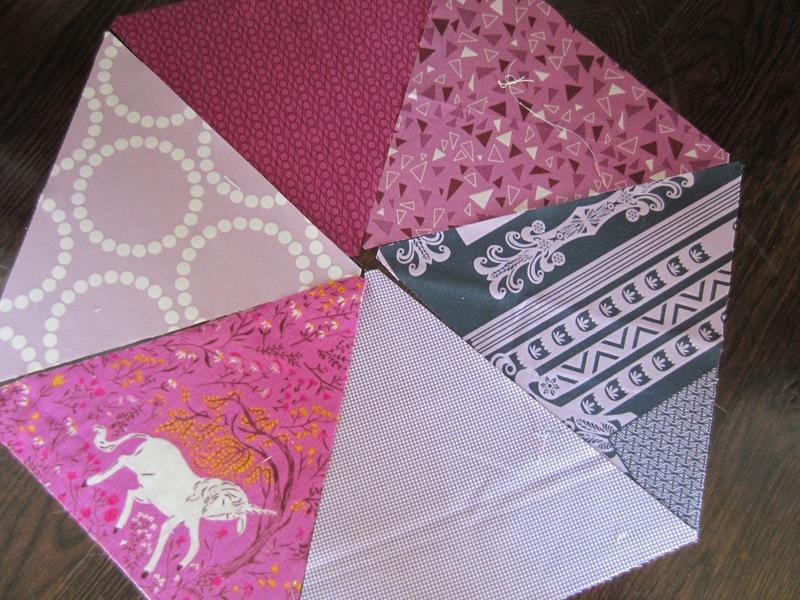 Then I realized you needed six different purple fabrics and quickly scrapped that idea. 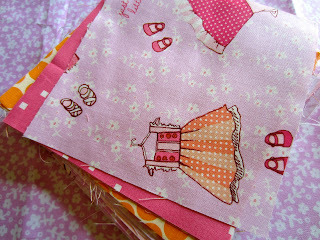 I decided to go for a more scrappy look, and to include some precious Heather Ross fabrics here and there. Wow, I don't have much purple in my stash. Thank goodness for Lizzy House, half my purples are her designs! I am so excited for the Patchwork Prism Quilt Along, and Bianca posted about fabric selection already. Almost time to get serious about cutting. After playing around with Patchwork Prism I got all of my fabric cut to make two baby girl Zakka Block Quilts as part of the Zakka Style Sew-Along. I just love this sweet fabric from Sarah Jane and was happy to finally have an excuse to use some! Finally, I am also working on a special quilt for a friend. She taught for a year in Japan and collected some beautiful handkerchiefs that she always envisioned being made into a quilt. Well, after discussing this on several occasions, we finally had time to meet up and explore a little. She really likes Rachel's Colorbricks Quilt and I was pretty happy, since I have made it once before, here. We chose Kona Ash for the sashing, or "mortar." I cut the bricks out last weekend and was a little worried when I could only get fifty bricks out of her fabric. Then I realized the additional five I needed would be cut in half anyway and I was able to get ten more squares from the leftover pieces. Hooray, just enough! So, my priority is to get these baby quilts finished before the babies arrive, keep up with the Patchwork Prism Quilt-along and work on the Japanese Colorbricks in between. Exciting stuff to be playing with fabric and sewing in straight lines again! What about you? Did you participate in KCWC? Did you make it? What are you dying to do now that that's over? I love the color brick layout. It's so good for showcasing fabrics. Good call!